Yep. 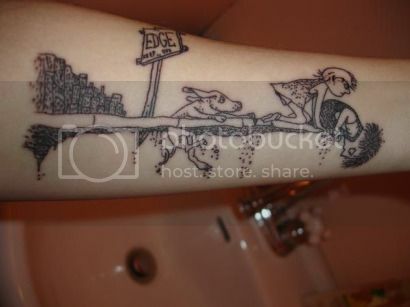 An excellent Where the Sidewalk Ends tattoo, a tribute to Shel Silverstein’s classic collection of poems and drawings. I’ll keep my commentary to a minimum since you’re probably overwhelmed by your sense of sentimentality at the moment. Now that is an awesome tattoo. Oh, well that is just…. *sniff*…. if you are going to have something emblazoned on your skin for the rest of your life what better than wonderful childhood memories. I actually spotted a very cute girl with this image tatted across her shoulders at this year’s Museum of Comic & Cartoon Art Festival here in NYC. I might snark on it, but I’m planning my share of geeky tattoos, & I love me sum Uncle Shelby.